This topic contains 1 reply, has 2 voices, and was last updated by Revery 5 days, 9 hours ago. 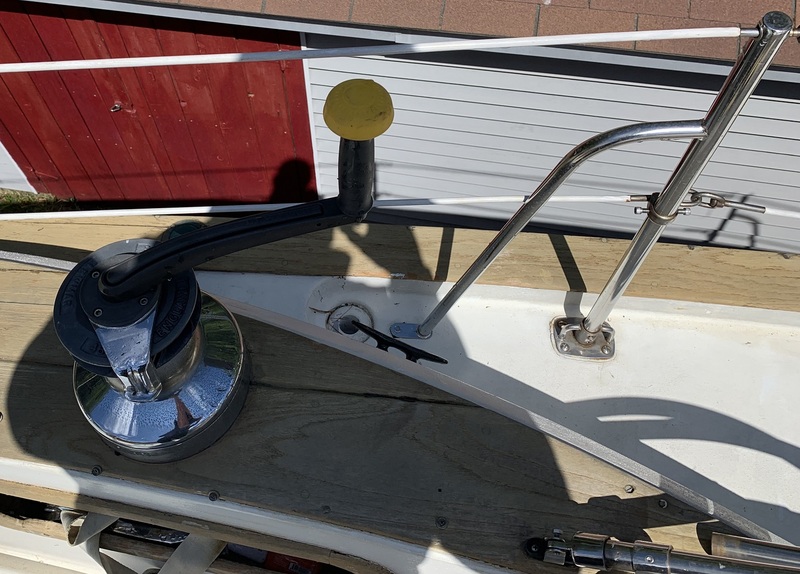 My lifelines are just a bit too low over the coaming, leaving short access above the winches. It’s always been a struggle to find handles that fit in the tight space. I ordered new stanchions from Garehauer to replace my gate stanchions. They are 2.5″ taller and fit in the existing bases. The stanchions have a welded brace with a welded pad to replace the inadequate original brace used by Pearson. 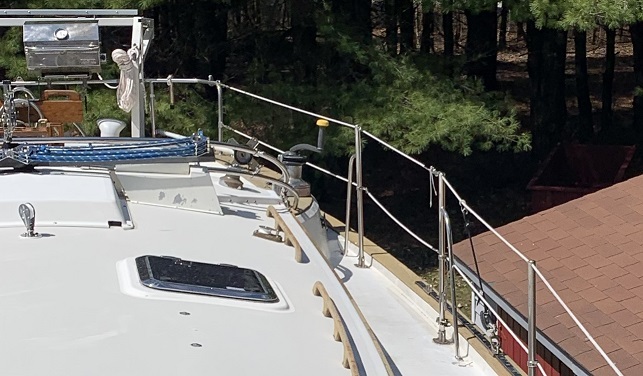 I replaced the roller-furling blocks that clutter the deck with Garehauer stanchion mounted blocks. Photos attached. This fixes several annoying problems. The handles now fit without hitting the life-lines. I could refit with larger winches. Higher stanchions provide better support when exiting the cockpit. The gates are stronger and less likely to stress the deck when crew grab them when entering and exiting. The old furling blocks were a tripping hazard. Removal of some of the old stanchions was difficult. Two were frozen in-place and required a soaking with PB-Blaster. The lower life-line Ferules required a torch to heat the set-screws for removal. Replacement screws are on-order. I had to tap holes in the new stanchions where the base screws attach. 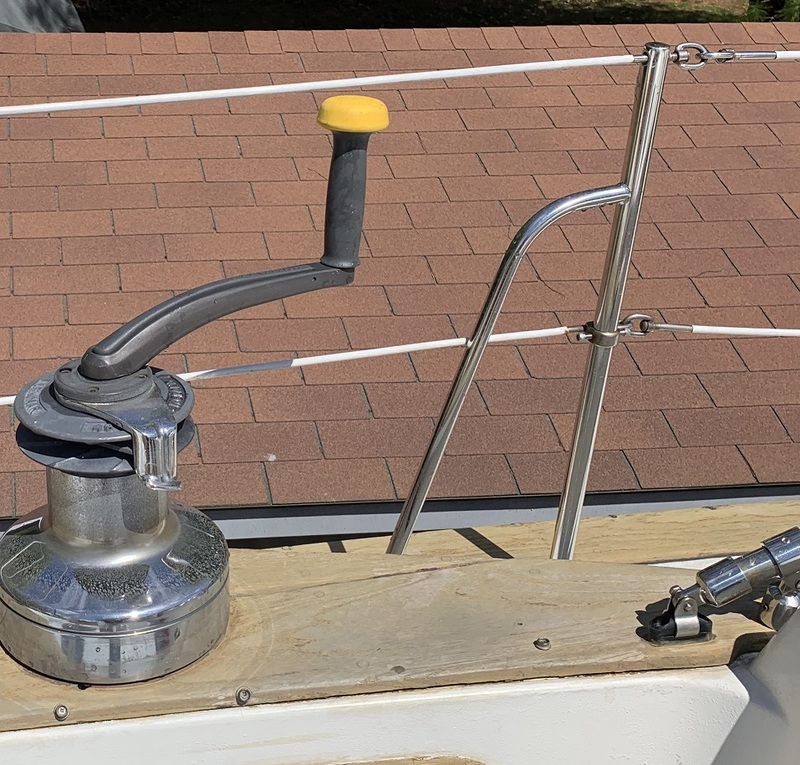 Not an easy task with stainless. Access the the gate-brace through-deck bolt is not easy. I have four original stanchions available should anyone need a replacement. We did exactly the same thing…33″ stanchions from Garhauer. We also eliminated the lower lifeline cable from the gates aft. HUGE improvement and I highly recommend everyone else do it. In true Garhauer fashion, impeccable fit / finish and cheap. Next up, one of their rigid boom vangs and maybe jib cars. Well, as soon as we get back from loafing in the Bahamas for the last three months. Life could be worse. Ha!